St. Matthew’s UCC annual Fallfest and Car Show is only a few months away! Registration and sponsor information has been updated on the Car Show page. There are sponsorship opportunities available starting from less than $20. Please also consider donating items for the Silent Auction Table, Car Show Door Prizes, and items to be included in the Car Show Goodie Bags. Online registration for the car show will open in mid-July. 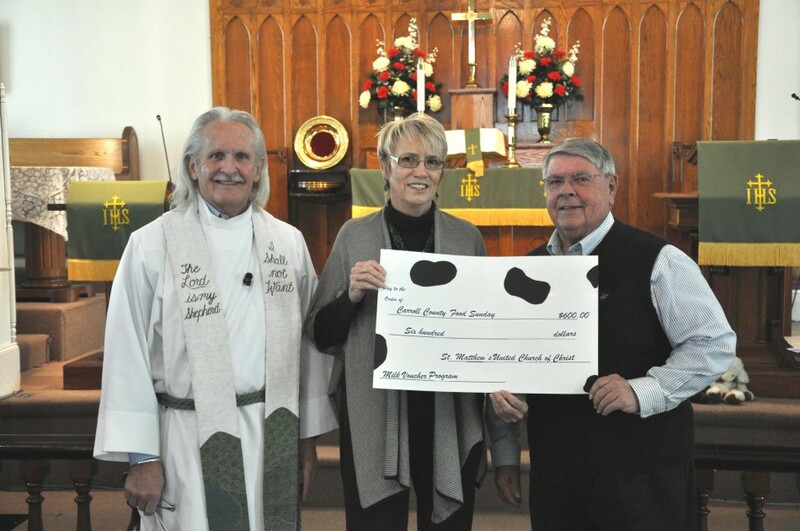 On Jan. 26, 2014 St. Matthew’s United Church of Christ, Pleasant Valley, presented a check for $600 to Carroll Food Sunday. The money, designated for milk vouchers, was raised through cookie sales and a milk mustache contest held during the Fallfest event on Oct. 12, 2013. Pictured from left: Rev. Gerry C. Hanberry, Pastor of St. Matthew’s UCC; Betty Cree, Chairperson of the Fallfest committee; and Edward Leister, Past President of Carroll Food Sunday. On Christmas Eve (December 24), please join us for our Family & Children’s Christmas Eve Worship Service at 7:30 PM. During Advent our worship theme has been a “Journey to Bethlehem.” During this service we continue on that journey “To Find the Christ Child.” Scripture Readings: Isaiah 9:2-7 Psalm 96 Titus 2:11-14 Luke 2:1-14, (15-20) Sermon: “Seeing Christmas Through Jesus’ Eyes” The Sacrament of Holy Communion will served during the worship service. Candles will be distributed to the congregation prior to the service, and a portion of the service will be conducted by candlelight. Due to inclement weather, the Family Christmas Program for tonight (December 8th) has been rescheduled for Sunday, December 22nd during the regular Sunday worship service which begins at 10:45 a.m.
Join us for worship as we continue on our Journey to Bethlehem on the 2nd Sunday of Advent (December 8, 2013). This week we explore the Journey to Bethlehem: To Find LOVE. Scripture Readings: Isaiah 11:1-10 Psalm 72:1-7, 18-19 Romans 15:4-13 Matthew 3:1-12 Sermon: “Looking for Love in all the ‘Right’ Places” Also, don’t forget about our Family Christmas Program December 8, 2013 at 6:30 PM.